Only 7 left in stock - Order today! This beautiful Italian Amoire spares not detail. Adjustable removable shelves are included for each section along with a removable 14 bottle wine rack. Further customize your piece to fit our 32 bottle wine refrigerator (not included). The top half boasts glass doors, interior lights, electrical outlets, mirrored back, adjustable shelf and pullout marbleized ceramic prep shelf. Fri, May 3 - Tue, May 14. Can the bottom shelf be removed for that space (bottom floor to just below top shelve) to accommodate a small mini-frigerator; and the top shelve (located on lower left area of furniture) to accommodate a small microwave oven? 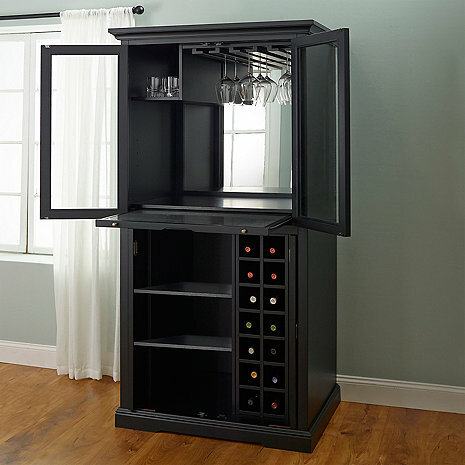 BEST ANSWER: The Firenze Wine and Spirits Armoire Bar (Nero) shelves can be removed to accommodate a fridge and they can also be moved up or down depending on your requirements. The width of the shelving area is 34 inches high by 17 inches wide. We recently purchased vacation condo and needed extra room for bar/wine supplies and this was the perfect fit for the space available. We also purchased the optional wine fridge that allows both vertical and horizontal storage, which perfectly compliments the wine bar. We also had a good experience with the "white glove" delivery staff who were pleasant, professional and competent. Except for the small gripe that the interior electrical cord is white (while the unit is black), we are very pleased with the wine bar and would highly recommend it. (p.s. - we were also very pleased with our contact Lou Ann at The Wine Spectator. who was very helpful in answering questions and assisting with coordinating the delivery).